Don’t you just HATE it when people stuff cookies with chia seeds and brownies with sweet potatoes and muffins with quinoa?? I’m not gonna lie…it irks me a bit when people post a recipe for chewy chocolate chip cookies and the ingredients are dates, protein powder and spirulina. And I know “pancakes” made with bananas and eggs are totally the thing, but I’m just not feelin’ it. That’s more like a scamcake. The whole quinoa in a muffin thing only happened because I had extra quinoa sitting in the fridge next to my never-ending Tupperware of pumpkin. I swear you would never know it’s there (even though it tastes like nothing anyway). 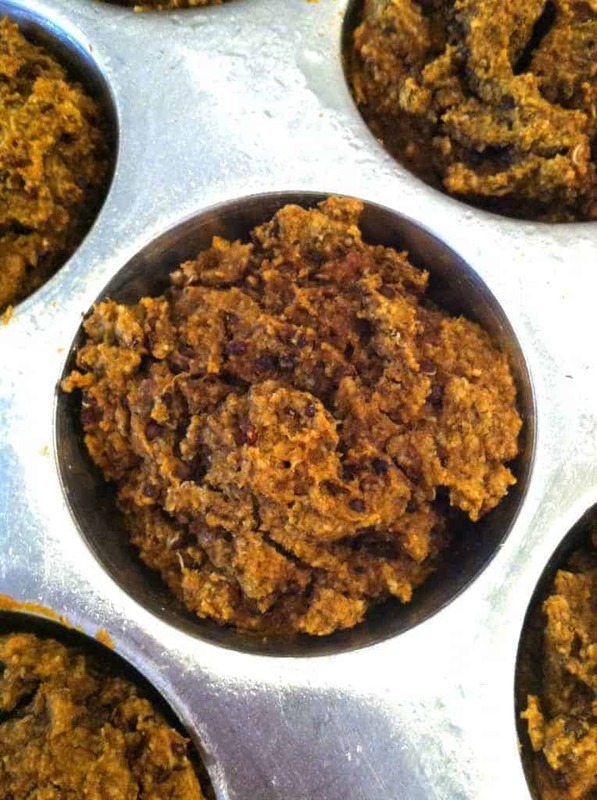 I was planning on picking one of the bajillion pumpkin recipes floating around the blogosphere, but considering the fact that I’m the most indecisive person on God’s green earth, I decided to play around with my old pumpkin quinoa muffin recipe instead. This recipe was kind of annoying. I can’t believe I posted it only nine months ago!! Oy vey. First of all, it called for pure maple syrup in the ingredients and agave in the directions. Then it called for an egg AND an egg white…I mean is that really neccesary?? Probz not. 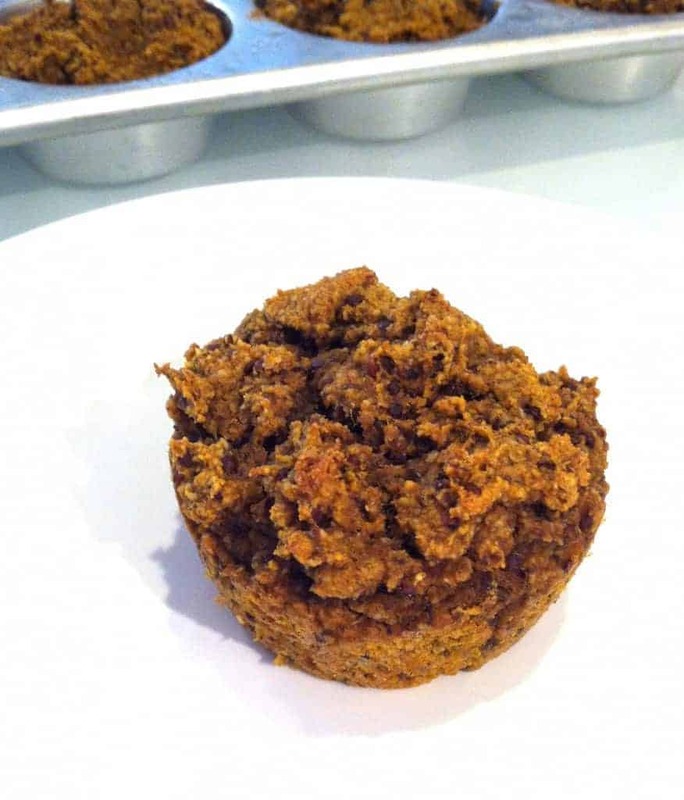 With a little tweaking, I ended up with a fabulously moist and uber healthy pumpkin muffin recipe loaded with oodles of healthies like flax, quinoa, almond meal and oats. These bad boys are gluten-free and have no added oil or refined sugar. Zilch. You probably got enough of that shtuff last week in the form of Milky Ways and Snickers to last you for a month anyway, right? scamcake! Could not agree more! Just because it’s circular doesn’t make it a pancake!!! Such a good point– a circular sweet-tasting omelet does not mean it’s a pancakes!! Scamcake legitimately made me laugh out loud :lol: But I know what you mean about all the wonky add-ins and substitutions — I’m not the hugest fan myself, but I try not to knock ’em till I try ’em because there can be some good ones out there. My mom is experimenting with going gluten-free, so I’m going to pass this recipe along to her. Hahaha glad it gave you a laugh! You’re right–there are definitely some good ones out there! Thanks for passing it along! Hahaha love it. So many recipes getting a healthy makeover when it clearly does not need one NOR is it respectful to do so- don’t give me a scoop of protein powder microwaved and tell me its a nestle toll house cookie. I’m stupid but not THAT stupid. What’s not stupid- this recipe! I told myself to try using Quinoa is a sweet baked dish and this fits the bill. Champion. Hahaha so disrespectful. Quinoa in muffins = major. I have seen that…it’s HYSTERICAL. So freaking cute. I don’t have a website – yet! – but do have a fb page! I’ve shared your recipes, and credited you of course, and several of my friends have subscribed to your blog. Yay! These muffins are the BEST! I add 1/4 C pepitas, 1/4 C sunflower seeds, and 1 coarsely grated apple to my mixture. I also substituted hazelnut flour for the oat flour, and added 1/2 C rolled oats. Sensational! Thank you SO much for your incredibly scrummylicious recipes, incites, and openness. You’re an inspiration! Thanks so much for the love, Nikkii! These are such interesting muffins. I’d never thought about putting quinoa in them, but that’s a fabulous idea. They look wonderful! The quinoa was just dying to be tossed into the batter, I’m tellin’ ya! Great Post! I have never been brave enough to try one of these recipes, but after reading your post I think it is about time I bit the bullet and tried it. I could see these being delicious if you used applesauce and cinnamon spice instead of the pumpkin also with some walnuts for crunch. Have you tried that? These will be great for keeping my craving for sweets down as I taper for my marathon on the 17th! Bite the bullet and go for it!! I love your applesauce idea, too! And isn’t everything better with walnuts? I would maybe try adding a bit less applesauce since it’s more moist, but I haven’t actually tried it. Soooo I’m guilty of loving the banana/egg pancakes, or scamcakes if you will. I also love real pancakes, though. But nonetheless if you can come up with a treat recipe that has some nutritional benefits and tastes great, I’m all for that (in other words, these muffins look seasonally delectable). Ha! I love going back to old recipes to see how jacked up they were. These look like they were worth the remake though. I’m all about some pumpkin and chocolate right now and I love that they’re so pure and clean. Get in mah belly! I could seriously redo pretty much all of my old recipes! mmmmm, fall muffin staple. I wanna pluck one from the screen! I reallly really like chia in my muffins in flax in my pancakes but egg + banana = pancake? I can’t even hop that train. Glad you agree that an egg and a banana does not a pancake make. Nuh uh. I’m new to your blog but I am enjoying it very much. I have a question on the muffin recipe. Could you replace the flax seed with chia seed? I can’t use flax seed. I have a Thyroid issue and the one of the things I’m suppose to avoid. Or would you suggest something else. Thanks, Maria! I think you can definitely use chia seeds. You probably don’t even need 1/4 cup. I’m sure a couple tablespoons will do. You could also just some some rolled oats. Let me know if it works out! Love that you went back and remade your old recipe! I have plans to do that with a few of mine, too… and I am also totally guilty of putting quinoa in things. People go crazy for it, so why not? These muffins look delicious, and I love the healthy and simple ingredient list!